This fun, fast-paced class will concentrate on dynamic movements such as drops, rolls, beats, circles, and twists. We’ll begin with half releases, foundational rolls, and basic movements from beats as we build strength and technique to progress to trickier moves, including full releases. This class is mixed-level but intended for intermediate aerialists or students who have a solid base of strength and body awareness. 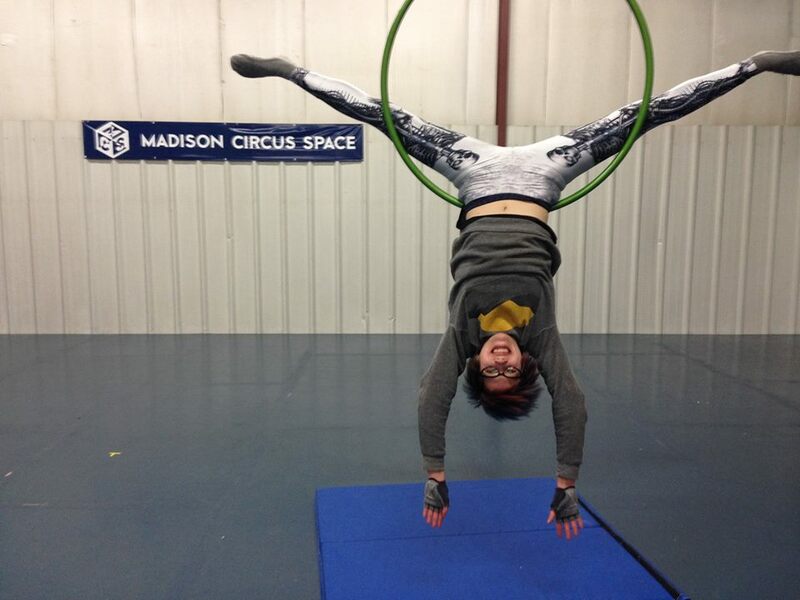 Carly Schuna has been teaching circus arts since 2013. After initial training on German wheel and static trapeze, Carly grew to love dynamic movements such as beats, rolls, releases, and twists. She completed her lyra teacher training with T. Lawrence-Simon, head coach at Esh Circus Arts in Cambridge, Massachusetts. Many of the movements Carly teaches translate from trapeze (but are a different kind of fun and challenge on lyra! ), and others are unique to aerial hoop and the opportunities it offers. Carly enjoys challenging her students and encourages them by focusing on building foundations of strength and awareness. Please complete and submit this form to register.